Firm supports Big Brothers Big Sisters 2018 Bowl for Kid's Sake campaign - Phillips Murrah P.C. Friends and family of Phillips Murrah employees attend Bowling Night on May 10 at Dust Bowl Lanes to show their support for Big Brothers Big Sisters of Oklahoma. 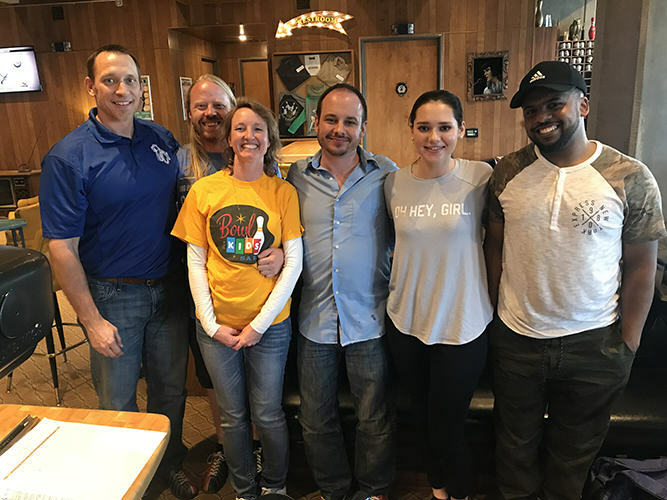 After weeks of fundraising events for the annual Bowl for Kids’ Sake campaign, Phillips Murrah surpassed its goals to beat 2017’s fundraising total for Big Brothers Big Sisters of Oklahoma. The Firm celebrated its fundraising efforts on May 10 at BBBS’s annual Bowling Night event hosted by Dust Bowl Lanes. Director Byrona Maule spearheaded the campaign, raising more than $4,500 for BBBS.